Debenhams has rushed out a statement to try to reassure investors over its finances, but says annual profits will be below June's downgraded forecast. It says profit will be £33m, compared with previous guidance of £35-40m. The new estimate was in line with current market forecasts, the retailer said. Shares plunged 16% after the company confirmed on Sunday it had appointed KPMG to help improve its performance. The chain said on Monday that KPMG would help maximise shareholder value. It said the the consultancy's activities were also aimed at protecting other shareholders, "including our employees". Debenhams said net debt would be about £320m, also in line with forecasts, and giving it "significant headroom" on the £520m it was permitted to borrow under current loan agreements. It said that it had strengthened its financial position, giving it "comfortable liquidity" for the peak borrowing period ahead of Christmas. Chief executive Sergio Bucher said the market environment remained "challenging and underlying trends deteriorated through the summer months". However, he said that the early weeks of the new season had "shown more positive trends". "Any sustained upturn would result in a rebound in our profit performance," he added. 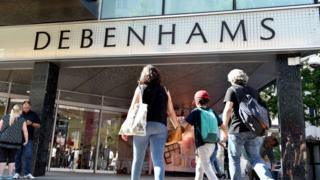 On Sunday, it emerged that Debenhams had brought in advisers from KPMG to assess a number of options to improve the fortunes of the department store chain. The retailer is in the midst of a turnaround plan designed to cut costs and boost sales. Industry insiders say the firm and KPMG are looking at a number of potential options, including a company voluntary arrangement (CVA), but it is just one possible measure under consideration. A CVA is a form of insolvency proceedings that can be used to close stores and renegotiate rents. Debenhams has issued three profit warnings this year, and has lost two-thirds of its share price value since January. As part of its cost cutting, Debenhams said in August that 80 to 90 jobs at its headquarters would be shed. That followed a February announcement it was planning to cut 320 store management jobs. It is a troubled time for traditional retailers, with House of Fraser entering administration and Marks and Spencer saying it intends to close 100 shops. However, given the fact that very few of its 170 stores are actually loss-making, Debenhams will want to look at all its options before making any decisions about reducing the size of its estate. Mr Bucher, who joined Debenhams in 2016, aims to put more emphasis on food and beauty and improve the firm's online platform. Sports Direct boss Mike Ashley, who bought House of Fraser out of administration and who owns just under 30% of Debenhams, is believed to be watching the latest developments closely.